I posted this on Facebook on the evening of November 1, 2016. 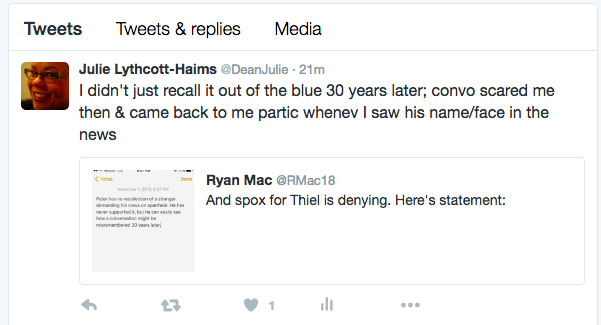 I’ve been holding this memory inside of me for over 30 years and when Thiel endorsed Trump back in July I knew I shouldn’t keep it to myself any longer. I spoke with a New York Times reporter about my experience, but nothing came of that conversation. I suppose I was kind of relieved — it isn’t my ambition in life to take on a billionaire let alone one who’s proven to be vindictive when crossed. Then I learned via Twitter that Peter — through a spokesperson — was denying that our conversation had even taken place. Notice how the spokesman is spinning the situation. That I was a “stranger” “demanding” Peter’s views about Apartheid. Plays right into the “angry Black woman” trope, you see? I assure you, I didn’t demand. I was timid and respectful as I approached his dorm room and initiated the conversation. I was a 17 or 18 year old Black kid approaching a white guy who was rumored to approve of Apartheid. I was terrified. I don’t doubt the veracity of the spokesperson’s statement — it’s entirely plausible that Peter lacks any recollection of our conversation. This topic meant little to him and my question was an intrusion into his day, his thoughts, his perspective, and what he said back to me was of no import to him. He practically dismissed me with a wave of his hand. That’s why he doesn’t remember it. It was unremarkable. To him. In deference to the old adage, “Hold your friends close and your enemies closer,” I wanted to know what the hell they were up to. But I could have picked up the magazine from the stack in our dorm lounge when the paper came out every two weeks. Why did I really subscribe? Because I thought that maybe if I was on their subscriber list they wouldn’t harm me. Looking back on those times from the vantage point of 48 years old, yes, that’s how afraid I was of Peter Thiel and his kind. That is why I remember the damn conversation. Look, bottom line, this happened. I’m not the only one he said it to. It was a large all-freshman dorm with about 165 frosh and 9 or 10 staff. Others heard it. Maybe they’ll come forward. Maybe not. When Peter came out, I hoped this was a sign that he was feeling some identification with what it was like to be society’s “other.” That maybe he’d evince some empathy not just for the LGBT community but for the experience of other people on society’s margin. I’ve not seen evidence of that however. I’m not out to ‘out’ anyone, or to harm Peter Thiel. 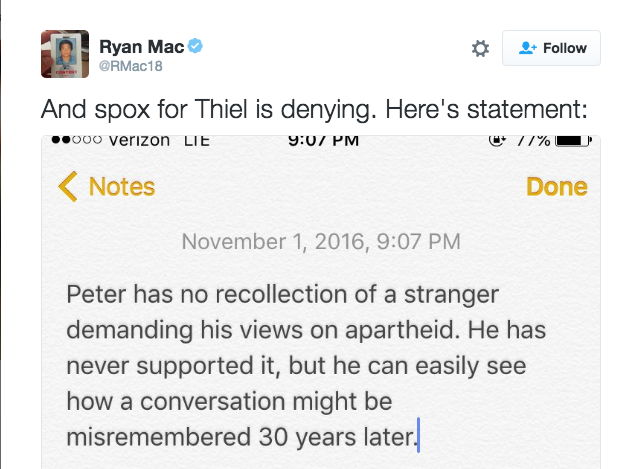 Frankly, given what I know of him from media reports, I expected him to acknowledge it with a quick “So what?” I posted about my experience with Peter Thiel from 30 years ago to ask the question, what does it mean for our country when a man who held (and perhaps still holds) these views about South African Blacks — and by extension perhaps others at the bottom of capitalism’s hierarchy here in the U.S.— is one of the major endorsers and financial supporters of the 2016 GOP Presidential candidate? Quality of the Memory: It was such a scary conversation for me that I talked it over with friends immediately after. We continued to reference it over the years as Peter did something newsworthy. We’d shake our heads in dismay that someone with such abhorrent views about humans was nevertheless succeeding so very wildly! So, it’s an old memory, but a fresh memory. And I pared it down to what I’m certain he said. That is, I could have included more detail but I am not 100% certain about those other things, so I chose to keep it to the stuff I could 100% back up. Legitimacy of Timing: Yes, it happened a long time ago, but why does that make it less legitimate? I guess I mean, when is the right time to bring up such a story, anyway? It’s not as if Peter had said or done something criminal; there was no tribunal to which to take my experience, fear, or concern. He had the right to say what he did. I had the right to feel how I did in response. It wasn’t an “issue” worth bringing to the attention of others until he attached himself to a Presidential Candidate whose own views about others/outsiders/minorities/immigrants/blacks/women/white supremacy have been at best questionable, and that’s to spin it very nicely. The story is only relevant now, now that Thiel is attaching himself to a political candidate whose views have a tenor and tone eerily similar to what Thiel said to me way back when. 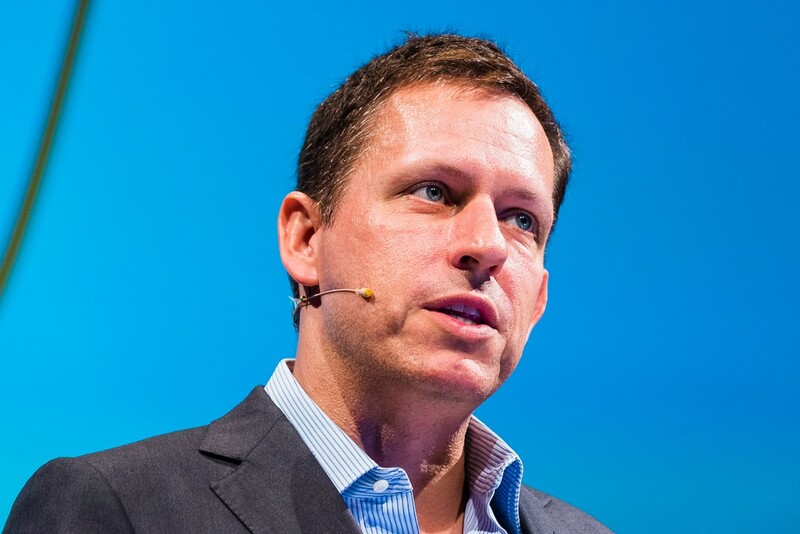 Purpose for Sharing: I wrote my post to invite inquiry into whether the Peter Thiel of today still holds opinions similar to those he once expressed to me — over the years I’ve heard anecdotal evidence that in fact he does, but who knows? We should want to know, though, since he’s a major public figure. If Peter, one of Trump’s most major financial supporters and a hugely influential person, still holds views about some swath of humans being trodden upon for the good of the whole, then I think we all ought to be interested in knowing more about that. And we ought to ask Trump about it, too.